Four Star Solar PV Centers combine photovoltaic control of large solar systems into a single, compact, easy-to-use unit. 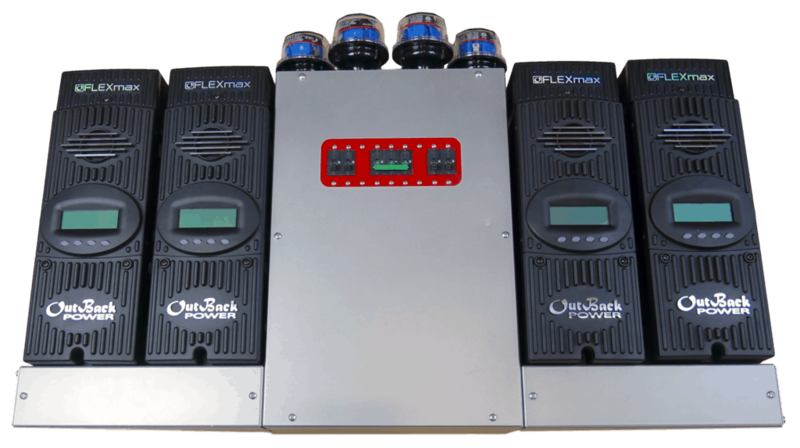 Our PV Centers are pre-wired with Flexmax FM80 charge controllers from OutBack Power which are renowned in the industry as efficient, reliable and durable controllers. This PV center includes the required DC disconnects, shunt-based battery monitoring and ground-fault protection for a safe and code-compliant installation. This pre-wired unit saves you or your electrician hours of time by combining all solar control into one box. Attach your solar panels and batteries and you are ready to go. Each charge controller can handle up to 4kW of PV input for a total of 16kW PV capacity.